Trauma is the most frequent cause for jaw fracture in cats. Automobile accidents, animal fights (especially cat and dog fights), blunt trauma, dental (tooth) extraction complication, falls and gunshots represent cases Dr. Kressin has managed. 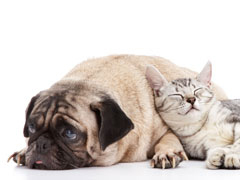 These injuries can be devestating for cats and their owners. It is very important to establish an early diagnosis and treatment plan to allow these cats to get back eating. Feeding tubes and pain management strategies can be highly beneficial for these cats. Cat injured by a dog bite. The right jaw was fractured and the mandibular symphysis was severely disrupted as there was bony exposure. a fractured third premolar tooth. Wire reinforced splint for repair. Alternate view of the splint.